When one thinks of English summertime, rain, subdued cricket matches, village fêtes, tennis, strawberries and cream, spring to mind. If you are really lucky, you might bump into a group of Morris dancers, which to the casual observer, may seem quite eccentric. 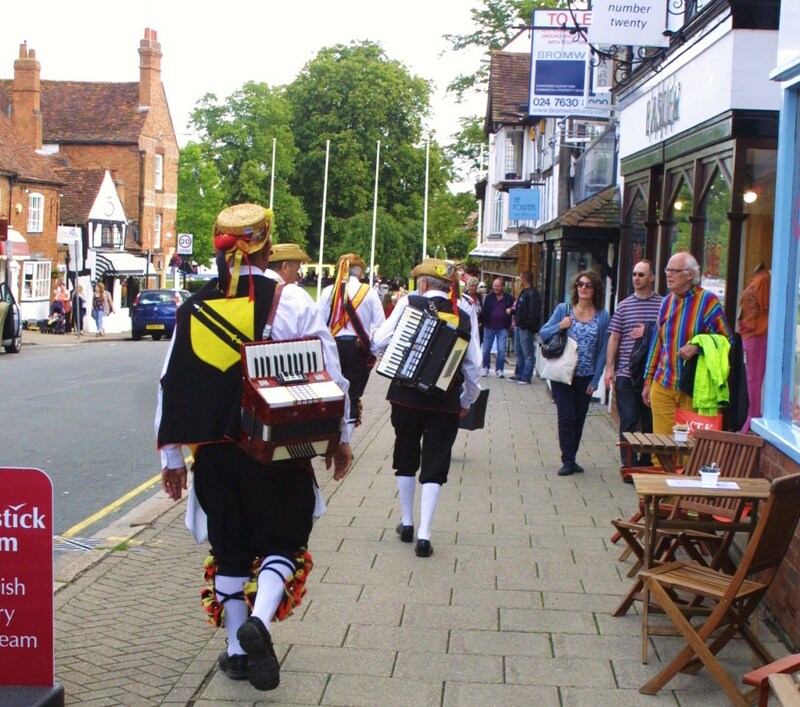 Featuring men with bells on their ankles leaping about with handkerchiefs to the sound of a merry accordion, lively dances are performed throughout summer, followed by the quaffing of many a tankard of ale at the local pub. 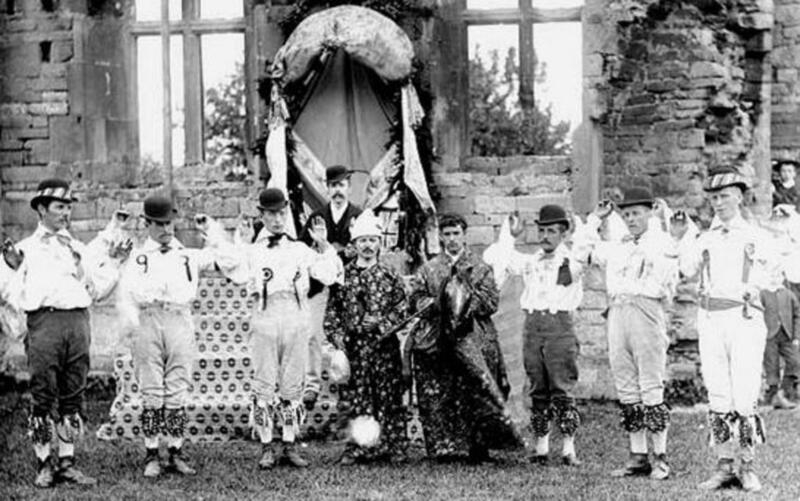 Despite the jokes about Morris dancing, it is in fact an important tradition, featuring and preserving different dances from various villages and regions. Each dance is as unique as a story, and without the men and women participating, the dances would be lost forever. I was lucky enough to spend the afternoon with the Shakespeare Morris side and find out more. With my directions sent to me by text, I was ready for my next interview. In the heart of Stratford-upon-Avon, world famous for it’s links with William Shakespeare, I would be meeting a troupe of Morris Men. I arrived early, and so took my time making my way to the gardens located on the banks of the river Avon. After a short while I spotted a man making his way towards the gardens from the opposite side of the river. Wearing a crisp white shirt, knee high white socks, black breeches, and shiny black shoes, he looked a little unusual. More so, with the accordion strung across his back. He looked to be in a hurry. Not wanting to delay him by asking if he was with the Side, I cautiously followed at a distance up Sheep Street and into the Rose and Crown pub. Within, the sound of lively conversation, laughter, and clinking of pint glasses provided the ambient noise. Decorated traditionally and furnished with dark wood stools and tables, the Rose and Crown was a respectable establishment noted for its craft beers and ciders. I spotted a small group of Morris Men up ahead, and as I approached heard them discussing their forthcoming dances over pints of ale. They welcomed me heartily as I introduced myself. I explained how I had found them and they didn't seem to mind. If anything it made them chuckle to think that I had followed one of their Side through the streets of Stratford like Alice following the rabbit down the rabbit hole! We had a little time before the performance, so I took the opportunity to begin to ask some questions. I wanted to know more about their clothing. 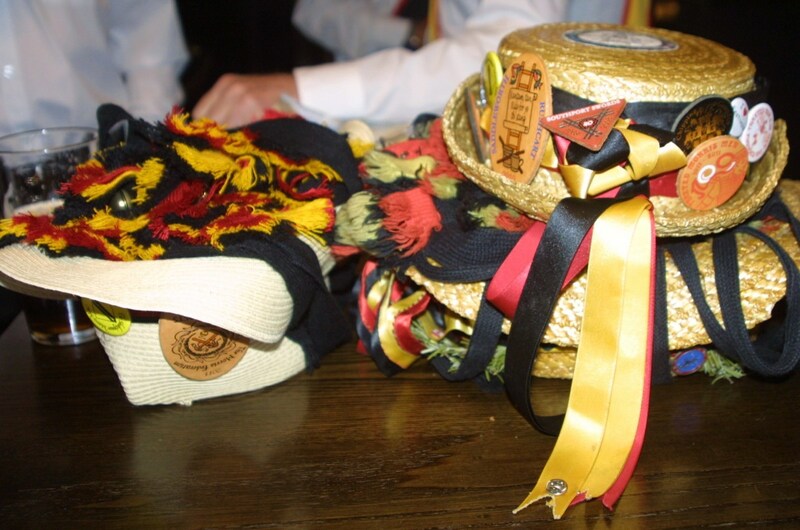 The whole group was dressed the same manner with straw hats decorated with ribbons and badges from attended events on their heads, with the rest of their costumes consisting of white long-sleeved shirts, sashes across their upper torso, black breeches, long white socks, and shiny black shoes. “The baldric, which is the sash worn across our upper part, is black, red, and gold which are our colours, the colours of the Shakespeare family,” explained Patrick Herlihy. Patrick continued by briefly explaining the origins of the side. “The Shakespeare Morris group was formed around fifty-four years ago by a group of scholars from the King Edward VI Grammar School, which William Shakespeare himself was said to have attended. Some of these founder members are still active with the club." "The Shakespeare Birthplace Trust granted permission for the group to use the colours and heraldry of the Shakespeare House, and to name themselves after the famous bard." Bidford-on-Avon is a town within Warwickshire, ten miles downstream along the river Avon. Dating back at least to Anglo-Saxon times, Bidford is picturesque but not as well visited as Stratford-upon-Avon. The Cotswold Hills rise up in the south from the picturesque rural landscape and are noted for being one of England's treasures, having 'Area of Outstanding Natural Beauty' status. Straddling Warwickshire, Worcestershire, and Oxfordshire, these hills feature sweeping vistas and picturesque villages, vast woodlands, meadows filled with wildflowers and countless important historical sites. Agriculture is a major way of life for the people who dwell in this area, with grain, wool, and vegetables and fruit from the Vale of Evesham contributing greatly to the local economy. It is from this region that the Cotswold Morris Tradition hails from, but there are many more, which Patrick kindly described. “There is the North West Clog, which has its roots in Manchester and Cheshire, which is thought to have stemmed from the cotton mills of the Industrial Revolution. 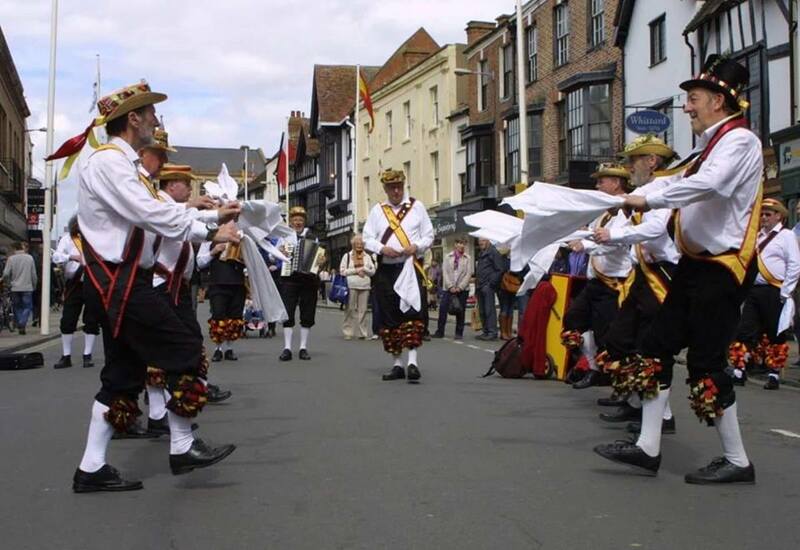 Then you have the Welsh Border Morris which is on the Marches (the area where English counties meet the border of Wales) where the dancers may blacken their faces and wear ragged jackets." 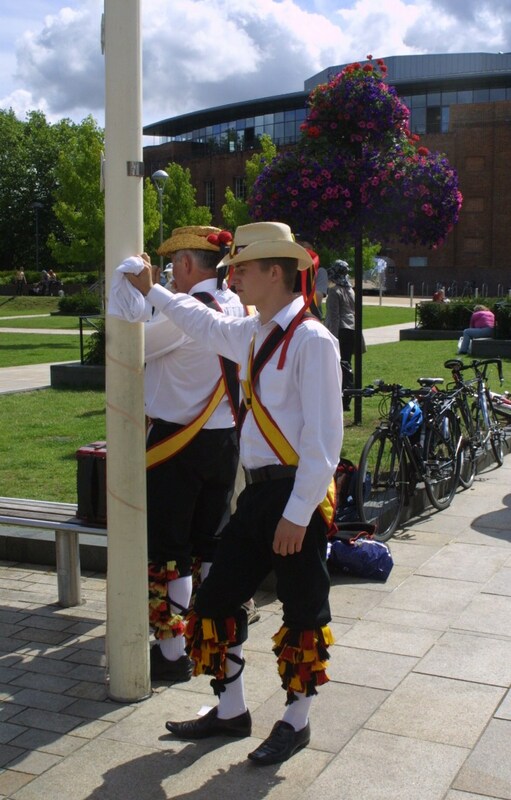 A Morris group is known as a ‘Side’ and traditionally consists of male dancers as historically it was an activity carried out by the men of villages. In recent years, many have welcomed the addition of ladies to join them, largely due to the decline in popularity among the population in taking up Morris. There are however dedicated Ladies' dancing Sides, who give the men a good run for their money! 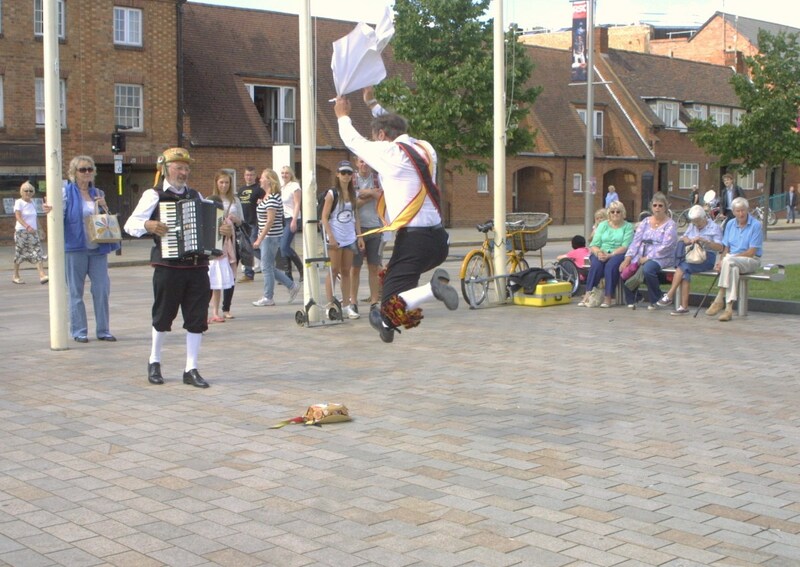 Women musicians are allowed, and the Shakespeare Morris Men had a lady within their trio of accordion players. Morris Dancing is a very ancient men’s tradition; so old in fact that it was being described as being ancient in records from the 15th Century describing these dances. It is widely thought that the dances carried out in spring and summer, had origins with old fertility rites to help ensure a good harvest in autumn, and demonstrate the vigour and strength of the men performing and their fertility too! Unfortunately, there is no hard evidence to attest this. As it is a tradition passed down through the generations verbally and in the performances themselves, nothing was written down to specify the purpose of the dances. I asked Patrick what sort of dances they would be performing today. “We’ll be doing some dances from Bidford-on-Avon, and we will also be doing some dances from a village called Stanton Harcourt which is near Witney in Oxfordshire." He then started to describe an event in the Welsh Marches held each year on the last Saturday before Christmas. A great gathering of Morris Dancing groups from all over the country, which was coming up to its fortieth year; it was to be quite a spectacle. The Cotswold tradition which was more active in the summer months, contrasted with the Border Morris tradition which seemed to be more of a winter tradition. Wearing ragged clothes and decorated with dark face paints, this seemed to be growing in popularity as the 'rock'n'roll' of the Morris world! At that point, our conversation was interrupted by a cry of “Bells on, time to go!”. Glasses were emptied and the men tied rows of bells around their shins. Heads turned in the pub as the patrons watched the side prepare. You could sense the anticipation among the Morris Men as they marched out of the pub and down Sheep Street. “What do you think of the funny looks?” I asked, noticing visitors to Stratford stopping in their tracks to gawp with mouths and eyes wide, at the sight passing by. Many stopped to take photographs, whilst others just stared in disbelief. “Well it’s quite fun, really.” replied Pat. I could only imagine what any innocent tourist in the town would have made of that. Stratford has a reputation of being unique and a bit eccentric, so a troupe of men wearing jingling bells on their legs was rather tame in comparison to some of the things seen out and about. I sensed a mirth and mischievous nature among the side, but more than anything, a sense of pride to be representing an ancient English tradition for all to see. Once the side reached Bancroft Gardens, they set up in the plaza. A popular space for local street entertainers, it is a perfect venue located outside The Royal Shakespeare Theatre, and falls under the distant gaze of a statue of the Bard himself. With a sharply cried introduction, the Master of Ceremonies announced their arrival and the dancing began with a flurry of notes on the accordions.The hypnotic rhythm of the bells added percussion to the accordions as the men performed their well-rehearsed routines. Visitors to the town paused from eating their fish and chip dinners, as reactions varied from confusion to delight. The crowd soon recovered from the surprise of the Side’s arrival, and took in the amazing spectacle before them as they gathered around to watch and enjoy the performance. Cameras and iPads were raised, as some of the tourists began to film the event. The Shakespeare dancers began with a series of dances incorporating handkerchiefs. Figure-of-eights, back-to-back, and face-on dances were executed perfectly as dances from Bidford-on-Avon, Stanton Harcourt, and the Cotswolds were performed. Then out came the sticks! The jingling bells were joined by the percussive clacking of wooden rods which the dancers used in one of their routines. During the dance, a rhythm was beaten out on the floor, and then the dancers raised the sticks against each other, as if taking turns to parry sword blows. It reminded me of clashing antlers, and the symbolism of the ancient fertility rites spoken about earlier were brought to mind. I was surprised by how frenzied the dancing was. The men must have a good level of fitness to be able to leap about in this manner, especially on a warm day such as this. It was the height of summer and before me a man in his seventies was leaping like a sprightly young lad as he jigged to the music. By now, quite a crowd had gathered. The sound of music, bells, and wooden sticks beating against each other was drawing in the curious. Visitors from foreign lands seemed delighted to have stumbled upon an English tradition, and several took a moment to chat to any of the group that were sitting out a particular dance to ask them about what they were doing, and what Morris Dancing is all about. 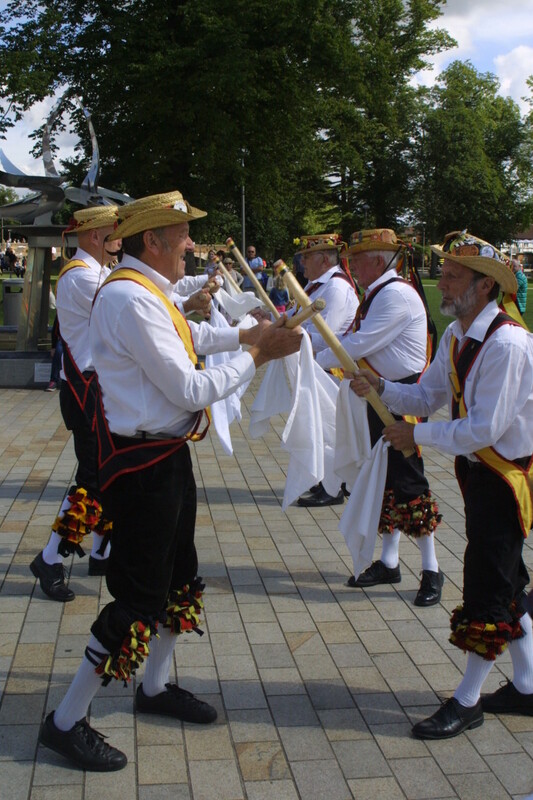 The side performed a number of dances, to the jaunty melodies of traditional folk-songs, and then cleared the plaza. Pat came over to explain how the next dance would be a one-man jig. On came a solo accordion player, with a lone dancer who took off his hat. There was a pause, and then the dance began. 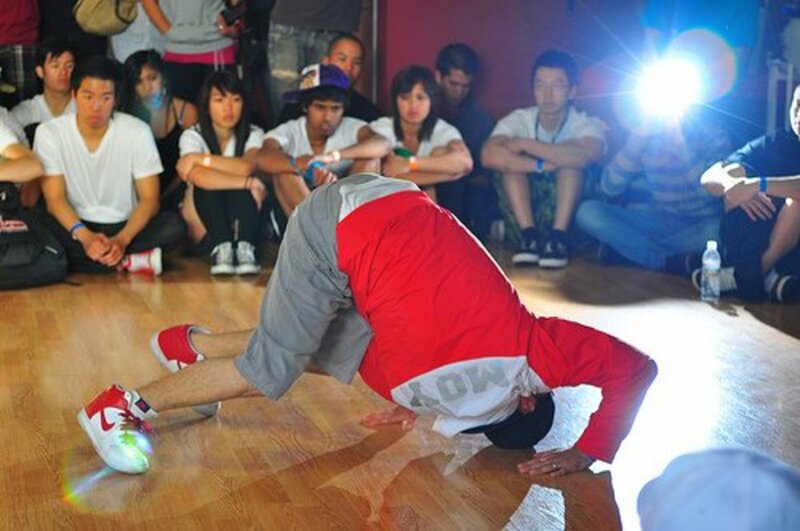 The music was energetic and lively, and matched the movements of the dancer who leaped into the air throughout the jig. There was a grace and finesse about the dance that I had never expected to see as part of a Morris dance. The crowd watched, mesmerised, as the performer carried out his performance, jumping up into the air as gracefully as any ballet dancer. When the dance had finished, the side announced that they were taking a break. The Gardens erupted in applause, and one of the men walked among the audience with a collection box. 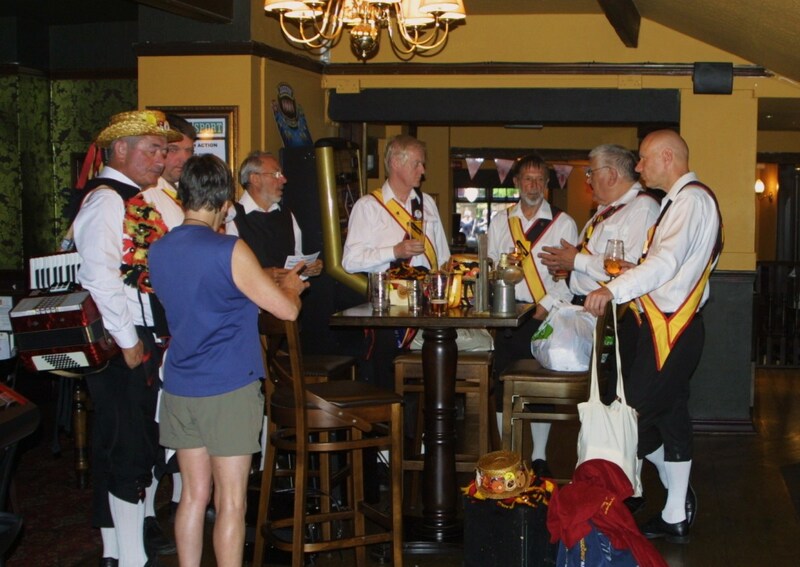 Traditionally monies raised from dancing would be spent on refreshments for the Morris Group, but in these modern times, the funds are used to help offset the costs of running the club and to provide free dancing events for those that ask for their presence. The Shakespeare Morris Men also contribute to local and national charities from the funds raised during their performances. We wandered back up Sheep Street to the Rose and Crown pub, where the exhausted dancers took a well-deserved break. It felt like half-time at a football match, and I would certainly compare the physical demands of this sort of dancing to any team sport. I had a chat with Phil Taylor, an expert on the history of the club and the general Morris tradition. Phil described the activities that they get involved with in Stratford-upon-Avon. 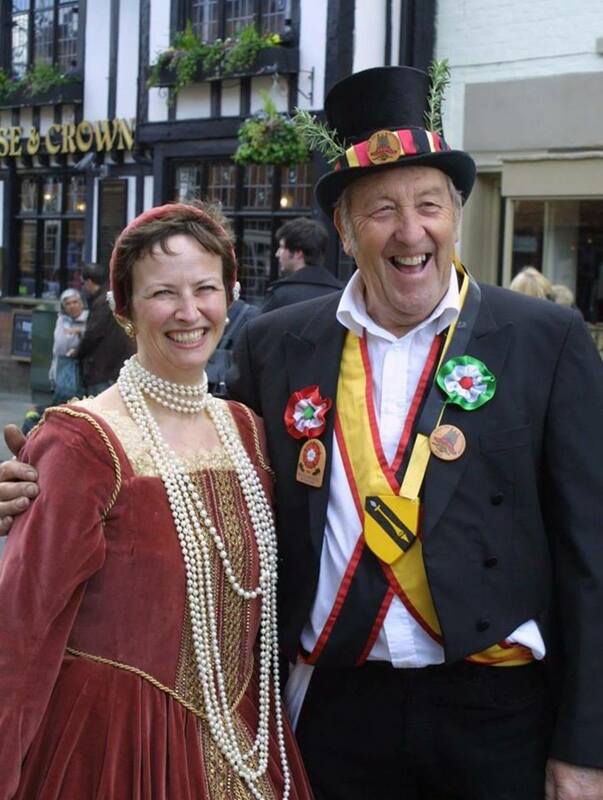 “We do a lot of things in the town, things like the Mop and Shakespeare’s Birthday procession, so we take part in that. 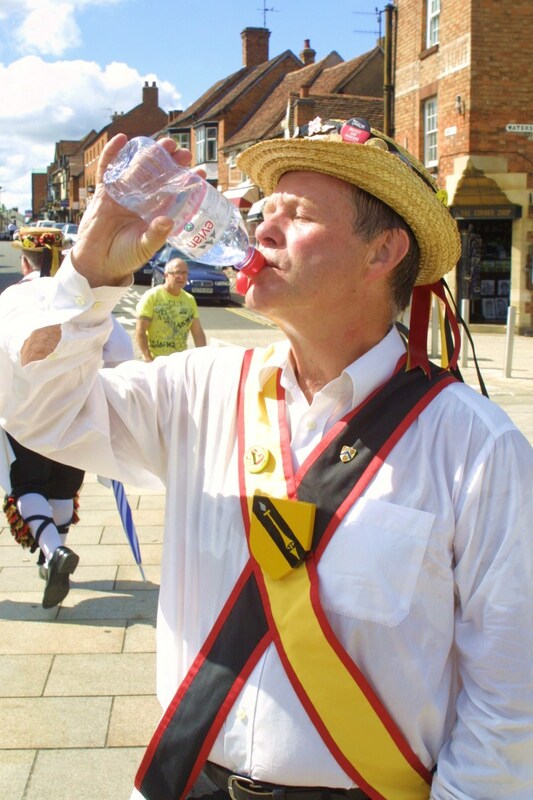 We also go all over the country doing displays with other Morris sides and abroad." 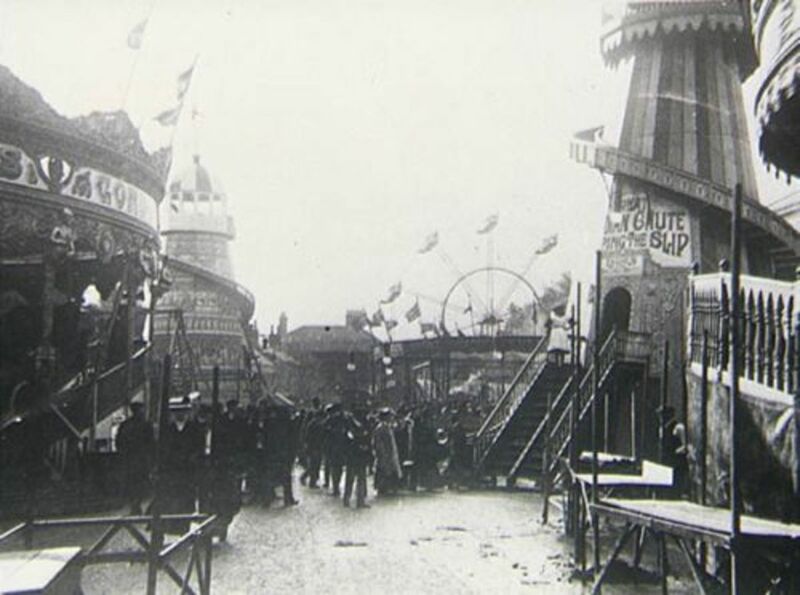 The Mop Fair is an annual festival, which first took place during the reign of Edward III (1312-1377). It was originally a time when people would gather to advertise themselves for labour. It had the function of a recruitment fair, but also was a busy time for the town with stall holders, side shows, and entertainers gathering. Phil then talked about the growth of the side’s renown. “The club became very well known for Rapper sword dancing, which is a Yorkshire dance. It is very fast, and is ideal for young men." "We probably can’t do it these days," he said with a rueful smile, "As we got older and not so flexible, but we were one of the best in the country." "We were invited to dance at the Royal Albert Hall with it, Birmingham festivals and things like that.” I sensed a sadness around this. With the years marching on, the members of the side are growing older, and there are few young men who are interested in carrying on this tradition. Morris relies on teaching the younger generation the dances. “The village has its own dances. It was revived in 1886 by a chap called D’Arcy Ferris and he really was looking to make a little bit of money from the local tradition." "He used to arrange things like Twelfth Night revels and Masques and this sort of thing, but he was interested in the Morris and he formed this troupe." Cecil Sharp is widely celebrated as being the saviour of the English Folk tradition. He travelled the country recording folk songs, dances, and customs. “What D’Arcy Ferris did, was to go around the Midlands, talking to old dancers who perhaps weren’t dancing or those that may still have been dancing. He engendered a lot of interest amongst people in their own clubs, which were dying because of the Industrial Revolution." D’Arcy Ferris was a very colourful character. 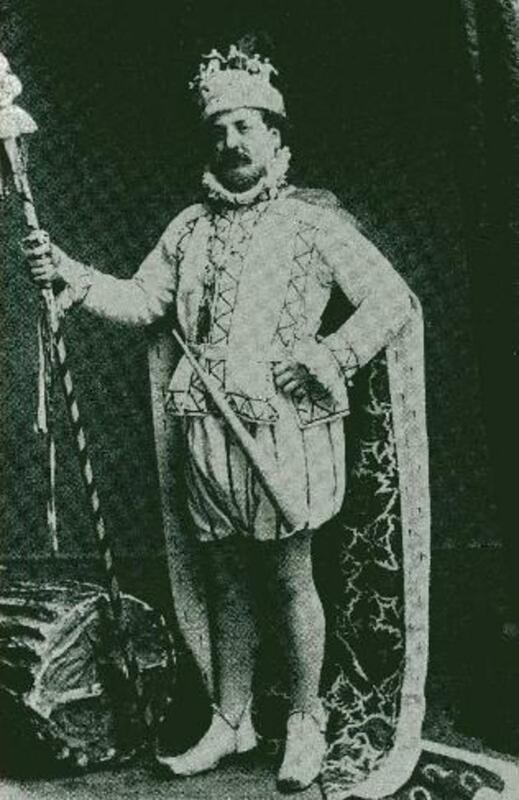 In 1886, he gave a lecture on the dances and customs of England and advertised for new members for a troupe which would circuit the Shakespearian villages, a cluster of villages around Stratford-upon-Avon. He declared that he had been crowned the Lord of Misrule in Bidford. This position has it’s roots with Pagan Saturnalia, but in Christian times became the title of the coordinator of entertainments and festivities, particularly in the lead up to Christmas. Many villages suffered terrible losses during the Great War. Some so badly, that not one of the men that went off to battle returned. The mood of Britain had changed, and industrialisation was bringing an end to the time of horse, plough, and merrymaking. “In around the 1950s, a school teacher called John Masterson formed a group in the local school and then they danced it. When these boys left school that disappeared, and that’s where we came in.” Phil added, a flourish of pride in his voice. “We go to Bidford-on-Avon on Trinity Monday, which is the traditional agricultural holiday and dance." "We had used to dance in the carnival and in the church and that sort of thing. If they want us, we will go. And that’s the Bidford thing." A lot of the old calendar dates of Mediaeval times and before are observed in the English traditions. Trinity Monday is generally in June, and tends to coincide with Midsummer. It is the Monday after Trinity Sunday, which is the Sunday after Whitsun. The Whitsun festival is held on the seventh Sunday after Easter. Phil went on to describe the popularity of this tradition in the region. With that, I left them to enjoy the rest of their break, before the time came for the second half of their performance. I was left feeling that the Side had worked hard to record and perfect the dances that have for so long been a familiar sight in the British countryside. With a recent interest in preserving crafts and the culture of the country, many people are now discovering Morris Dancing for the first time. In today's age of emails, instant entertainment and data streaming, this art is an escape and a beautiful form of expression. The Shakespeare Morris have fought adversity to preserve something very special. Although the dances have been recorded, it is vital that fresh interest from the younger generations is maintained to ensure the survival of this tradition. If you are interested in Morris Dancing or Mumming, it is worth looking up The Morris Ring at http://www.themorrisring.org/. This activity is a great way to keep fit whilst enjoying socialising and keeping a way of British folk tradition alive. Thank you Carolyn! It was a fantastic day, well worth looking out for if you get the chance to see this in action.